As a result of advances in printing and image reproduction technologies, by the late nineteenth-century, maps and globes had become affairs of everyday life in Western nation states. Atlases, such as Blackie’s Imperial Atlas of Modern Geography (1860), were standard fare in children’s education in the late nineteenth-century. The classroom globe served to instruct pupils as to the shape of their nation and its role in an all encompassing geopolitical space. In the first half of the twentieth century, touring maps sponsored by advertisers accompanied the rise of the automobile. Between the 1920s and 1960s, over 5 billion maps were given away at US gas stations alone. In the early twenty first century, with the increasing availability and accuracy of civilian geographic information system (GIS) data, online services such as Map Quest and GoogleEarth offer free, searchable databases composed of millions of satellite map images. Denis Wood estimates that 99.99% of all maps have been made in the last 100 years. The ubiquity of the map as a means of locating one’s place in relationship to the rest of the world created a unique opportunity for artists to exploit cartography’s language, symbols, and strategies. Political boundaries became iconic shapes, legible visual markers of identity and belonging that were ripe for artistic distortion, subversion, and reimagination. Raoul Haussman’s A Bourgeois Precision Brain Incites World Movement (1920), also known as Dada triumphs! ), is an early example of the symbol saboteur impulse. In this piece, the artist claims the entire world as the empire of the short lived Dada movement. The movement was informal and internationalist in organization. Its period, roughly 1916–23, coincided withWorldWar I and rejected capitalist logic, efficiency, and esthetics in favor of celebrating chaos, destruction, and ‘anti-art’. In Dada Triumphs!, the letters ‘DADA’ stretch across a map of the world at the top of the photomontage. In an absurd, utopian gesture, Haussman uses the recognizable shapes of the continents and the authoritative power of naming these shapes to appropriate the entire Northern Hemisphere under the international empire of a tiny art movement. The title and territorial ambitions of the imagery suggest a call to revolution, but the revolution appears to have happened in the name of nonsense. Nevertheless, this act of imaginary conquest calls attention to the naming conventions of cartography and the way that a map makes a world. Contemporary artist Nina Katchadourian works directly with printed maps in order to subvert and distort their iconography. In her cutout map series, she removes everything except the roads from maps of Austria (1997; Figure 2), Finland (Finland’s Longest Road, 1999), and the New York Subway system (Handheld Subway, 1996). 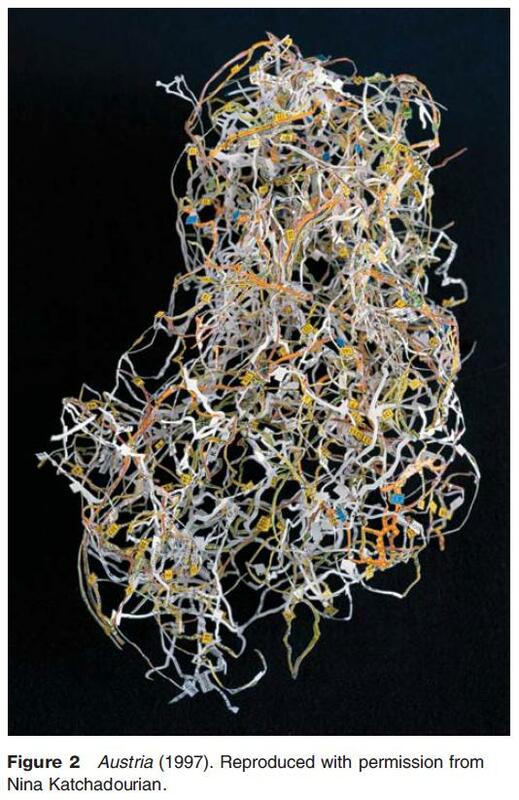 These works leave a fragile, messy tangle of paper behind, disrupting both the legibility of the map and our tendency to conflate the map’s symbols with reality. Rather than referring naturalistically to the roads it represents, the resulting object points back to its material origins as a designed, constructed, and printed artifact, subject to transformation and dissent. Given the ubiquity of maps in educational settings, national boundaries alone provide rich iconic sources for artistic interrogation. In the case of the US, there are numerous refigurings of the US shape, as it is commonly understood on the geopolitical Mercator projection classroom map. 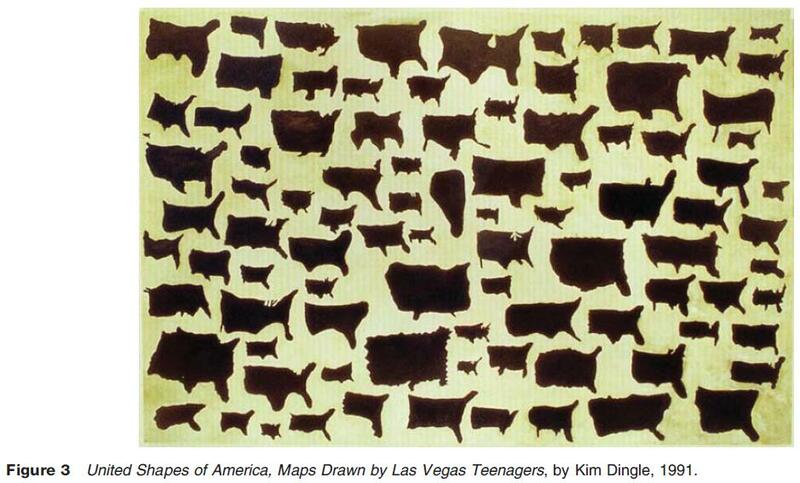 For example, in 1991, Kim Dingle asked Las Vegas teenagers to draw their country, and then she painted the results (United Shapes of America, Maps Drawn by Las Vegas Teenagers; Figure 3). Through their similar but slightly different bulges and appendages, the teenagers’ (see Figure 3) drawings indicate the ubiquity of the country’s shape in our imagination of place. At the same time, the multiplicity of suggested shapes challenges the notion of ‘right’ and ‘wrong’ representations of place. There is also a rich history of artists who use the language of maps to chart emotional, interpersonal, or imaginary territories. These artists use the symbology of the road map or geopolitical map for metaphorical purposes; as methodology for locating the individual subject within vast psychological, interpersonal, territories; and/or to draw geographical parallels between the vastness of the Earth and the scope of the human psyche. As far back as 1772, there is a map of love (New Map of the Land of Matrimony, Artist Unknown; Figure 4) that depicts the ‘Ocean of Love’, ‘Bride’s Bay’, and the ‘Land of Matrimony’. Contemporary works in this vein include 40 maps by Wim Delvoye, which allude to human anatomy and reference imaginary territories such as ‘Izuch’, ‘See of FioxXanilla’, ‘Gnody’, and ‘Gulf of Doj’. Finally, there was an explosion in the late nineteenth and twentieth centuries of cartographies of literary landscapes, such as Tolkien’s Middle Earth and Faulkner’s Yoknapatawpha County, a phenomenon extensive enough to be worthy of a separate investigation.